Much is remarkable with the new EP by Alec Troniq & Gabriel Vitel, even though remarkability seems a pattern applicable to all their work. „Mind Doodles“ had not just been their first collaboration, but also one of the biggest hits for Broque, having been streamed and shared on the Web by the millions. There a plenty of good reasons, why the follow-up EP „New New World“ is bound to become a similar milestone. Let’s start with the obvious ones: after having performed under a plethora of project names, this is their first joint release published under Gabriel’s name only, what puts his distinctive vocals even more into the spotlight, even though it had been the storytelling epicenter and trademark ingredient ever since. Similarly noteworthy is the fact that, Alec and Gabriel connected so well with the Dortmunder Philharmoniker while re-interpreting Dvorak a while ago, that they continued their collaboration, leading up to the “New New World” EP which features some first joint songs born from this fruitful yet unusual collaboration. These full-bodied songs in particular lift the drama of Vitel’s moving songs onto the big stage and underline the emotional drama present in most of their tracks, only to be gently guided back onto the dancefloor by Tony Casanova’s Remix of “Unknown Places”. 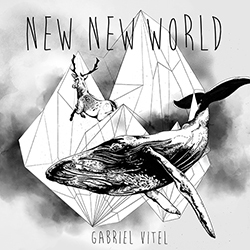 “New New World” contains big emotions for both club and concert hall and is a worthy successor of the “Mind Mill” EP. One question remains though: how the two are planning to ever top this one. We are more than curious already.